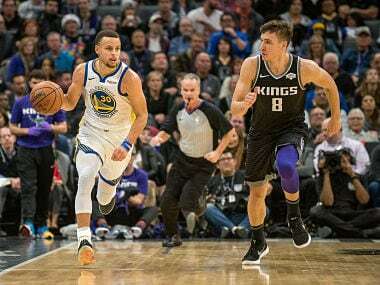 Los Angeles: Stephen Curry and Kevin Durant combined for 68 points as the Golden State Warriors rebounded from an embarrassing loss to the Toronto Raptors two nights earlier to beat the Sacramento Kings 130-125 on Friday. 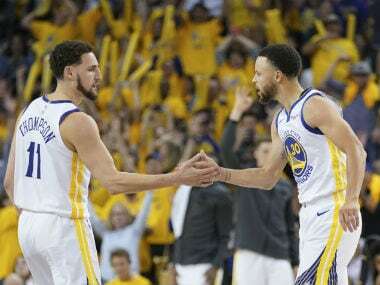 Curry made four clutch free throws down the stretch and Klay Thompson drained the go-ahead three-pointer with 38 seconds remaining as the Warriors closed the fourth with a big run after getting off to a slow start in the quarter. "We made some adjustments on the defensive side of the ball late in the fourth," said Durant. "We were down 10 points with three minutes to go after that it was a pickup game so you have to just try to get a bucket as fast as you can and we got stops." 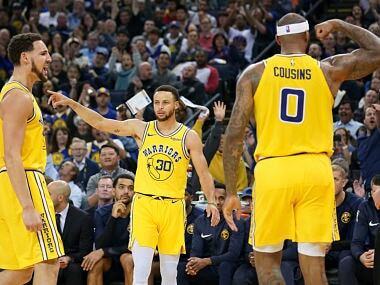 Curry finished with 35 points, Durant had 33 and Thompson had 27 points and nine rebounds for the Warriors, who outscored Sacramento 17-2 over the final three minutes. "We got to be better. We can't have lulls like that," Durant said. Golden State came into Friday's contest stinging from a 20-point loss at home on Wednesday to the league-leading Toronto Raptors. Draymond Green finished with 14 rebounds and 10 assists for the Warriors. 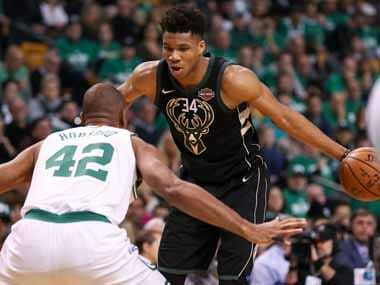 Elsewhere, Giannis Antetokounmpo recovered from the worst game of his season to match his career high with 44 points and the Milwaukee Bucks beat the Cleveland Cavaliers 114-102. 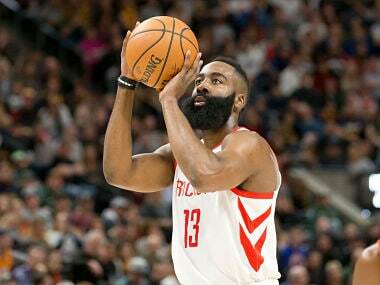 Two nights after being held to a season-low 12 points in a loss to Indiana, he was 14 of 19 from the field and made 16 of 21 foul shots. "You've got to put that game in the past," said Antetokounmpo, who also had 14 rebounds. "You put it in the past and move forward." Milwaukee were missing two key players — Khris Middleton, who was out with a sprained right finger and Malcolm Brogdon, who didn't play because of a sore left hamstring. Bucks coach Mike Budenholzer wasn't surprised Antetokounmpo was able to step up and carry the load. Also, Thaddeus Young torched his former team for 26 points and 10 rebounds as the Indiana Pacers overcame a huge performance from Joel Embiid with a 113-101 win over the Philadelphia 76ers. Embiid scored 40 points and added 21 rebounds to become the first player in the league this season with at least 40 points and 20 rebounds in a single game. He is the first 76ers player to finish with 30 points and 20 rebounds since Charles Barkley in December 1990. Indiana's Victor Oladipo returned from missing 11 games with a knee injury to tally 14 points and nine assists in the battle of Eastern Conference contenders. Oladipo especially made his presence known in the fourth quarter by draining some clutch jump shots. Bojan Bogdanovic had 18 points, and the Pacers won their sixth straight to pass the Sixers in the standings. "We were able to get some stops and make Embiid work a little harder, send some help to him, to our bigs down there and just execute it the second half," Pacers head coach Nate McMillan said. In Portland, Damian Lillard had 24 points and the Trail Blazers snapped a two-game losing skid with a 128-122 victory over Toronto. Zach Collins scored 16 points and Seth Curry added a season-high 13 as both were part of a Portland bench that outscored Toronto's reserves 58-26. Kawhi Leonard returned after missing two games and had 28 points for the Raptors, who played without all-star Kyle Lowry. Danny Green added 19 points and 11 rebounds.